The perfect cup of tea transports you to another world. It will melt away stress, give you laser-like focus, or lull you into a deep sleep. If your tea doesn’t do this, then you’re brewing it wrong. You see, there’s a massive difference between an average cup and a perfectly brewed cup of tea. While brewing that perfect cup of tea can have a learning curve, there is one simple trick you can use to take your tea to the next level of bliss: use a high-quality teapot with an infuser. Without getting too much into the detail, teapots allow you to have more control over your tea and provide more flavor (you can read more on this here). If you just randomly pick a teapot because it’s cheap or pretty, you could be making a big mistake. Many teapots with infusers out there are made from low quality materials. So when you put hot water in it, toxic substances leach into your tea. Not only does this affect the taste, but it can also cause significant damage to your body. That’s why it’s important to pick the right teapot infuser. Safety of materials – None of the teapots with infusers on this list contain any known toxins or heavy metals. Quality – Nobody wants a product that breaks after a few uses. Brew – How good is the teapot at brewing a brilliant cup of tea. This teapot infuser by Willow & Everett is the best of its kind. Since it’s made out of glass, you can rest assured that absolutely no chemicals or toxins will leach into your tea. This is why I usually recommend glass teapot infusers to anyone who wants to look after their health. Better yet, this teapot has over 1,000 positive reviews. That in itself is a reason to pick this one over some other popular brands. Microwaveable, dishwasher safe, spill & rust proof. Comes with a removable cozy to keep tea cold or warm for longer. Features a fine-mesh infuser so no debris enters the tea. It’s made from glass so there’s no toxins or heavy metals to worry about. Some people have complained that the zipper on the cozy can get stuck. If you pour too slowly, the spout can drip a little. Not designed to go on a stovetop or burner. If you’re an avid tea drinker, getting a traditional Japanese tetsubin cast iron kettle is a must. It’s the holy grail of tea infusers. The cast-iron provides a rich flavor that’s highly sought after by tea enthusiasts. But it’s important that you don’t get a cheap tetsubin. Cheaper tetsubin kettles are usually fakes, made in China, and have an enameled inside so you don’t get the flavor benefits of the cast iron. Plus, enameled coatings on cheaper products are often made with toxic materials. This tetsubin teapot, however, is the real deal. No enamel coating. While it costs more than the average teapot, it’s totally worth the money if you’re a tea drinker; you will have this thing for the rest of your life. Cast iron is the most durable material as far as teapots go. It provides a better flavor. It’s made in Japan as any real tetsubin should be. Not a lot of reviews because very few people know what a real tetsubin is, so they buy the cheaper knockoff versions. If you’re a guy and use other cast-iron cookware, you may want to avoid overusing it since men can easily get too much iron in their diet. It also costs slightly more than the average teapot (but totally worth it). Forlife sells one of the most popular and sought-after teapot infusers on the market. It’s high-quality, durable, and features an extra-fine infuser so that no debris gets into the water. This teapot really lives up to the name “Forlife,” as you should have this rugged thing for the rest of your life without worrying about it breaking. Dishwasher safe and made from a lead-free material– this is important! Offers 10 different color options. Has a silicone ring around the lid to prevent spilling. Features an extra-fine mesh infuser so that no tea leaves end up in the water. It also doesn’t drip at the spout when pouring the tea which is a common complaint with teapot infusers. Not designed for stovetop use. You must boil water in another vessel, then pour that water into the pot. Some people claim it’s fine to use on a burner, but you risk cracking it over time. They don’t explain what the coating material is made from. While they say it’s lead-free, they don’t say it’s free of toxins. It could be perfectly safe, but this is why I prefer glass over other materials. This 32 oz. teapot is slightly bigger than the other teapots mentioned here. Much like the other glass teapot infusers mentioned here, it got fantastic ratings. It comes with a cozy and features a more practical design that prevents spilling and leaking. What really sets this apart from other glass teapots with infusers is that it’s more durable. The glass is thicker than your average teapot. In fact, I couldn’t find one person who complained about it breaking, which is really impressive for a glass teapot! Infuser is removable and it holds more tea than the average glass teapot infuser. Glass doesn’t provide flavor like a Japanese tetsubin. It’s NOT safe to use on the stovetop or it may break. This glass teapot infuser has an incredible Amazon rating, it’s made from glass, and it comes with an impressive 2-year guarantee. This teapot has a slightly more elegant design. The only reason why this one rated lower because a small number of people seem to complain about the glass cracking. But both products are fantastic choices nonetheless. Stovetop, microwave, and dishwasher safe. Features a fine mesh infuser. Handcrafted from heat-resistant borosilicate glass. An elegant design yet affordable pricing. A small number of people have issues with the glass cracking or breaking. If you don’t dry off the stainless-steel infuser after washing, some people complain about it rusting after a few months of use. The spout can leak if you pour too slowly. Making tea in a teapot with an infuser requires you to use loose leaf tea. And when it comes to loose leaf tea, it’s all about nailing the ratio and steep time. Get it right, and you will have an incredible cup of tea. Do it wrong, and you can get a bitter or downright disgusting tea. I admit it can be difficult to master because every tea has different steep times and temperatures. Most people just wing it, but it doesn’t taste nearly as good this way. That being said, I highly suggest following this guide for brewing the perfect cup of tea. Combine this with the tetsubin kettle and you can turn anyone into a tea-drinking aficionado. 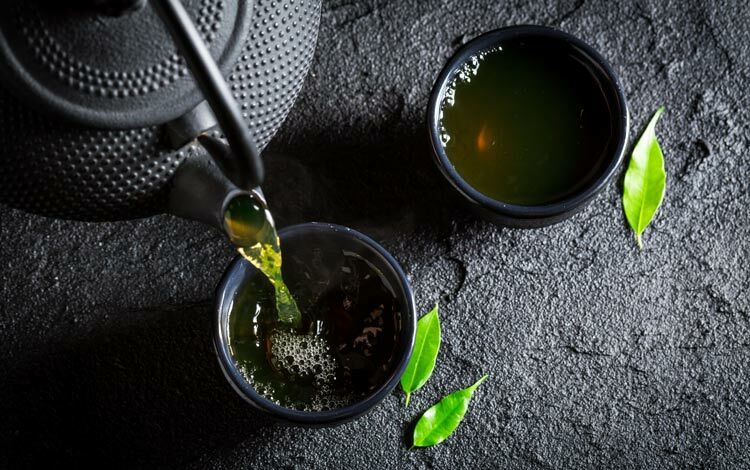 Drinking tea that’s been infused in a teapot comes with so many amazing advantages that once you start drinking naturally infused tea, you’ll never want to go back to tea bags. When it’s time to stock up on tea at the market, do you settle for the same kind of limited flavors available in teabags? Do you long for something different? More variety in your daily tea drinking regime? With teapot infusers, the sky’s the limit when it comes to variety. Imagine waking to a cup of Organic African Nectar loose tea or a cup of Egyptian Chamomile right before bed. There are an endless number of options when it comes to loose leaf tea. With some trial and error, you can discover the perfect tea for every situation. Whenever you make tea using a teabag, your setting yourself up for a subpar cup of tea. That’s because, much like coffee, the amount of tea you should use varies according to how much water its steeped in. A teabag doesn’t allow you to control how much tea you’re using. So the ratio of tea to water will almost always be off the mark. But if you use loose-leaf tea with a teapot infuser, you can use the precise amount of tea needed for how much water you’re using. The result is a smooth, aromatic, and divine cup of tea. Not only does using loose-leaf tea provide more flavor, but it’s also much more affordable than buying tea bags. This is because it is usually sold in bulk at specialty stores. Bulk is always cheaper. Plus, when you get teabags, you’re paying extra for the bags and the processing required to get the tea into the bags. While tea bags may be convenient, brewing loose-leaf tea in a teapot with an infuser is the way to go. The benefits of using a teapot with an infuser don’t end there. You see, many teapots, kettles, and other tea brewing devices contain toxic chemicals. When you brew your tea, the toxins leach into your tea water making it a big hazard to your health. That defeats the whole purpose of drinking tea! For example, some contain plastic which contains chemicals like BPA that are shown to cause cancer (1). Cheaper teapots will also have an enamel coating which often contains heavy metals like lead. Fortunately, all of the teapots mentioned here were heavily researched and shouldn’t contain any harmful substances that can get into your tea water. If you’re for some reason not enthused with my picks here, I’ll show you exactly what you need to look for in a teapot infuser. That way you can pick out your favorites and see if they check off all the quality requirements. Durable and well-built: Scan the reviews of the product to see if people often have problems with it breaking or wearing down. Safe and free of toxins: If the teapot is glass, you’re pretty much in the clear. Just make sure there’s not plastic on it. With other materials, I would avoid the enamel coating unless the brand states that it’s free of toxins. They should also be able to provide a report that verifies the safety of their product. Size: Pay attention to the size. Some are just big enough for one person. But if you will be brewing tea for multiple people, you will certainly need something bigger. Fine-Mesh Stainless Steel Infuser: The infuser should be made of stainless steel so that it does not rust. It should also be a fine mesh so that no debris gets into the water. When comparing and contrasting the above 5 teapot infusers I chose the Glass Teapot Kettle and Warmer by Willow & Everett because it hit on so many features that a teapot should have. It is durable, affordable, and people have given it incredible ratings. That being said, if you’re a true tea aficionado, I highly suggest giving the genuine tetsubin a try. It brings tea to a whole new level!